About to play with some really great musicians at the Paris Cat Jazz Club. We will be not only playing music from the “Irving Berlin” Songbook but also some compositions by Clancye and myself. 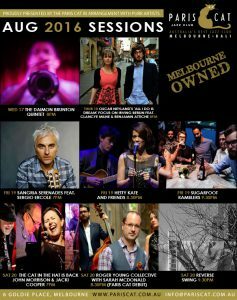 Thursday the 18th of August at 8pm at 6 Goldie Place, Melbourne.